Theses from 2009 - are available online in the CSU Research Output (CRO) repository as PDF files. The National Library of Australia’s Trove database lists most Australian university theses. Not all online theses are publicly available. Use Refine your results to limit to theses available Online or Freely available. Doctoral and Masters theses abstracts from US, European, British, and Irish graduate schools and universities, plus many available in full-text. OpenDissertations.org is a collaboration between EBSCO and BiblioLabs to improve discoverability of ETD research. Theses and dissertations from higher education institutes in United Kingdom. Registration required [free] in order to view theses online. International database of theses and dissertations. Theses and dissertations from more than 130 institutions. TREN includes conference papers from several academic societies. Theses and dissertations from Canadian higher education institutions. Searchable database of research theses held in European repositories with links to at least one electronic copy of every thesis it lists. Online union collection of Hong Kong and Macau postgraduate students' doctoral and master dissertations and theses. 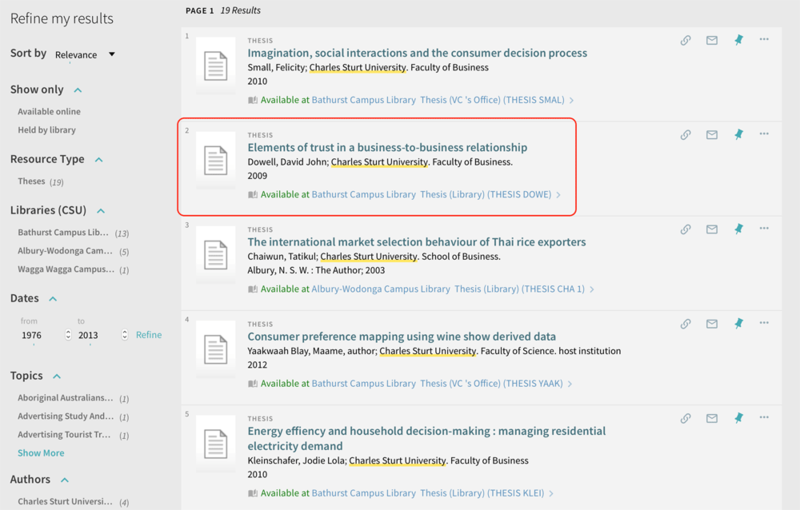 Some services, such as the ProQuest Dissertations & Theses Global database allow users to purchase copies. Alternatively, the library can locate and purchase a copy of a thesis on your behalf. Charges apply and are based on the rates outlined in the Australian ILRS Code but may vary according to the individual library. Interlibrary Loans staff will provide a quote before proceeding with the request. Use the ILL Request link in Primo Search to submit a request. Recommend a title for purchase using the Suggest New Materials form.